Some people don’t associate risk assessments with LeanGRC® principles. They believe that it is only important to ensure we are identifying and mitigating key enterprise risks; it is not critical to address potential inefficiencies of the risk assessment process itself. After all, they would say, if we fail to identify key risks and manage them properly, who cares if we save a few dollars on the risk assessments? These people view concern over efficiency of risk assessment as the tail wagging the dog. Although appealing at first blush, this view misses the point – leveraging LeanGRC® in your risk assessments can not only streamline them and reduce costs, but will also result in more accurate assessments. 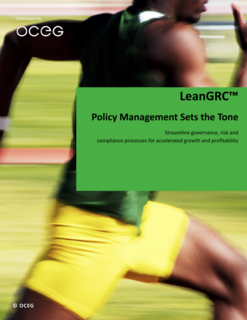 In short, applying LeanGRC® to risk management improves your ability to recognize and mitigate key risks. Please provide your email address so we can send you "LeanGRC® Risk Assessments". A link to "LeanGRC® Risk Assessments" was sent to Make sure the email arrives in your inbox: either add "support@oceg.org" as a safe sender to your email platform, or if you use Gmail, drag our email into your Primary tab.